This picture was taken in the summer of 2008. The kids are watching workmen pour a concrete pad so that the outside patio concrete would be level with the indoor floors. We had this done so that we could move forward on turning that outside patio into what has become an office. 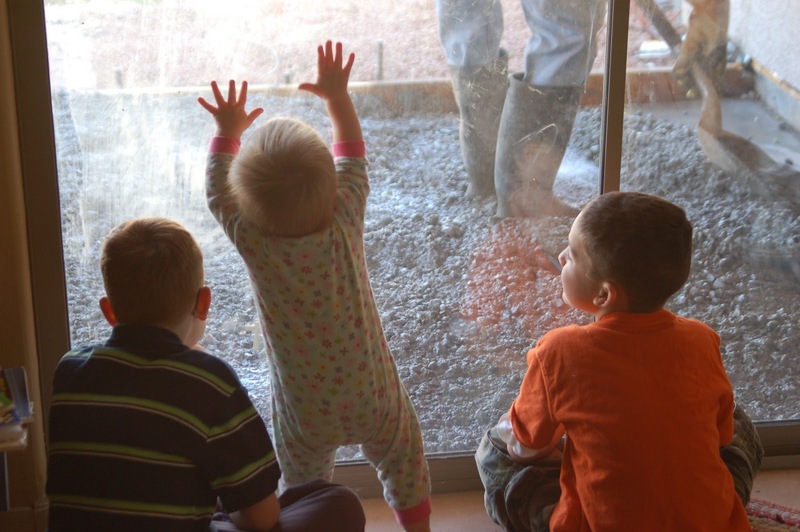 I spent many hours on the outside patio with the kids -- for years we had it fenced in so that Colin could go outside but couldn't wander our entire, large yard. It's also the place where I hung cloth diapers to dry & be bleached by the sun. I remember sitting out there in the heat of the summer when Nate was an infant because he loved the heat. That patio is gone, (although it took much longer to finish the project than anticipated originally,) but right now I'm sitting at my computer in an enclosed space that once was an outdoor patio. 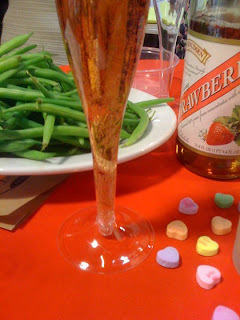 February is Hot Breakfast Month (who decides these things I wonder? I do think it's fun to celebrate them, though!) Last night, we had hot breakfast for dinner -- scrambled eggs, pancakes, bacon and orange juice. It's a favorite meal of my kids any time of day! Mom is the favorite breakfast chef? 42% choose their moms over celebrity chefs like Paula Deen or Rachel Ray? I wonder where dads fall in this survey, since Bo is the one to make hot breakfasts most weekends around here! 88% of Americans talk with each other during breakfast! I know we talk during breakfast, even if it's just mapping out the day's schedules or quizzing spelling words. On cold days, 2/3 of Americans prefer a hot breakfast over cold cereal (only 11% choose cold cereal) In our house, we eat cold cereal often during the week, but hot oatmeal is a top favorite, as are pancakes. 40% of men are dressed before they eat breakfast, while only 27% of women are. I wonder if that's because women are busy getting everyone out the door? In our house, kids are always dressed before breakfast and so are Bo & I. Before I begin my rant, I want to unequivocally state that I have the highest respect and admiration for my sons' teachers at their elementary school. I absolutely adore Colin's 4th grade teacher and appreciate how absolutely wonderful she is about communicating with me. Nate's teacher is also a gem, and has his best interests at heart. My rant is about the administration. I have now received 4 letters (2 for each child) chastising me about their absences. I think Nate has 13 this year, and Colin has 10. The letters ramble on about how important attendance is and how they want to work with me to make sure that my children are there regularly in order to achieve their potential. They state studies about poor academic progress by children who miss too much school. The last ones were slightly threatening by stating the truancy laws of our state. The principal assured me repeatedly throughout the letters how she has only my sons' welfare in mind, and that she is very worried about them. They also reminded me that I should provide doctor's notes for any absences. Have I sent along doctor's notes for each absence? No, I haven't. Why not? Because after 4 years of homeschooling I have never gotten into the habit of asking for a "note." And because it rankles me that they don't trust me (as the parent) to properly care for my child. I admit I took them out of school for 5 days for a vacation to DisneyLand. I don't regret it for a second. Both boys were doing well in school. I met with both of their teachers a month before our planned trip and worked out their schoolwork. They completed the schoolwork requested of them during their absence. The other absences are a result of them being sick. Nate has picked up numerous vomit bugs this year, and I'm sure the parents of the other children were grateful I kept him home. Both boys have had sinus infections, and they are only kept home if they have a fever or truly feel rotten. Today, Colin could have used a mental health day. It's not the Internet's business why, nor is it his stupid school administration's business. The bottom line is that I sent him to school partly because I didn't want another letter in my mailbox -- even though the mom in me felt that I should have let him stay home to work through the issue. His sweet teacher called me mid-morning to let me know that he was really struggling, but we decided to let him finish the day because he was already there -- and the toughest part of the day was over. I also believe that he needed to persevere, but a mental health day wouldn't have hurt him. A few weeks ago, I went to the office at 1:50 (about 20 minutes before the end of the day) to pick up Nate for a doctor's appointment. He had been under the weather and I sent him to school since he didn't have a fever and wasn't vomiting. Turned out he had a double ear infection. BUT, the school secretary gave me the stinkeye when I told her I needed to check Nate out. She typed furiously on her computer and then insisted I had to show my ID in order to check him out. She reminded me about the doctor's note (which I forgot) and basically made me feel like I was hurting him by pulling him out 20 minutes early. My children's education is of the utmost importance to me. It is one of the reasons I chose to homeschool, and is why I remain involved in their education and communicate often with their teachers. I have their best interests in mind when I make any decision. Regardless of the flowery language used in the letters I received, I don't believe they care one whit about MY children. They care about the tax dollars that those children represent. If they truly cared, they would have checked with their teachers to find out if the absences were causing a negative effect on their education. They could have checked to see if I was a parent who seemed to be keeping my boys home for my entertainment or amusement. They could have made it personal, rather than bureaucratic. It is those types of letters that make me want to return to homeschooling sooner rather than later, just to thumb my nose at the stupid office. Thanks to my sweet sister, Bo & I went out twice in the last 2 weeks. It had been much too long since we last went out alone! 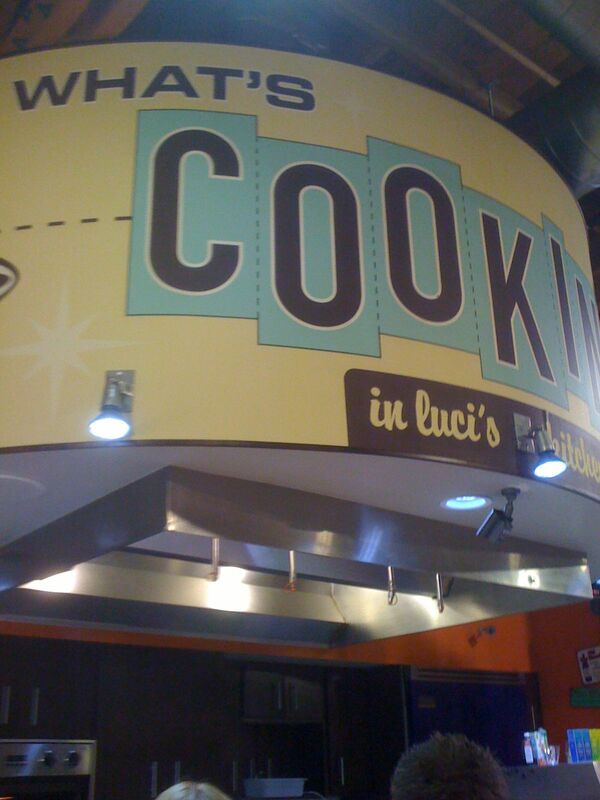 2 weeks ago we went to San Tan Brewery for dinner and last Sunday we went to a cooking class at Luci's Healthy Marketplace. I saw a tweet, which led me to a Facebook page, which led me to a company website, which led me to call and register the 2 of us for one of their Sunday cooking classes. This one was "Table for Two" in honor of Valentine's Day (which was the next day). It seemed like something different to do and I thought it would be a fun night. I had never heard of Luci's Healthy Marketplace before, but the pictures and the website led me to believe it was a cute place. They didn't lie! It is set up as part grocery store, part coffee shop, and part restaurant. It's not close to us at all, so I probably won't visit often -- but they do have jazz on Saturday nights so I can see Bo & I going again as a date night. They run cooking classes every Sunday night from 5:30 to 7:30. The class we attended was extremely well-attended -- with 40 participants. With that many people, there was much less hands-on than I was expecting, but we were able to watch Chef Michael Tardibuono create the dishes and then enjoyed eating them at the end. 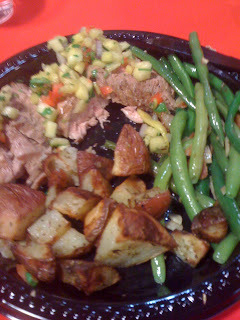 He created a delicious roast pork loin with fruit salsa, roasted red potatoes and green beans almondine. For dessert, we enjoyed a flourless chocolate torte. In fact, it was so delicious that Bo recreated it tonight for his birthday dinner! We invited some family & friends over and everyone declared the dinner delicious. I made him a vanilla/strawberry cake instead of chocolate torte, though, since he likes strawberry cake for his birthday. We definitely enjoyed our evening out, but we didn't really learn much regarding different techniques. I guess we're better cooks than we thought we were. Bo did say that he usually would have grilled the pork loin, so the preparation of that was a bit different and we definitely liked it. I was under the impression from some of their marketing that the classes were limited to 12 attendees, so I was surprised to find ourselves in a group of 40. The size limited the hands-on experience (we did snap some green beans and Bo volunteered to toss the potatoes), but at $40/person I felt that it was a bit expensive with the number of people. Chef Michael Tardibuono was engaging, interesting and talented. The entire staff was friendly and helpful and I liked them very much. I am bummed that we missed the knife skills class last month, but will watch for the next time they run that class as I think that is a class where we would learn something new. If you're looking for a different way to spend a Sunday night, and have an extra $80, check out one of their cooking classes (they still haven't posted March's classes). If you don't want to pay for a class, then I would stop in anyway and enjoy some of their coffee / tea / baked goods. It's a cute, retro place and I wish them much success! I almost can't believe their faces here. 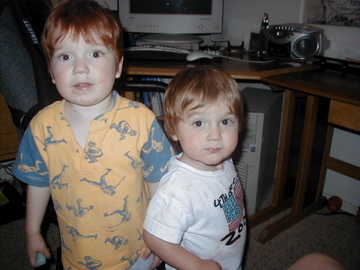 Well, I can totally believe how grimy they look -- as they are boys and they did love to play in the dirt (still do!) But, those chubby cheeks are long gone on both their faces. Their closeness hasn't changed, though. They are still connected to one another and best of friends. May that always be true! The first yogurt I ever remember eating is Dannon's fruit on the bottom when I was a kid. I loved scooping the fruit up into the yogurt! Nowadays, I'm more of a Greek Yogurt fan. Right now, Dannon is encouraging everyone to take small steps to becoming healthier. 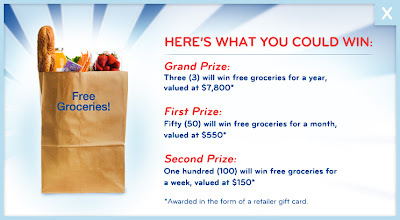 They are running a sweepstakes on their site which gives you a small step idea, as well as entering you into a drawing for free groceries! Who among us couldn't use free groceries? They are giving away free groceries for a week, a month and even a year! The small steps are interesting, and although some may feel like common sense, they are still good reminders! The tip I got today suggested sauteing vegetables in broth instead of butter -- and that's exactly what I plan to do tonight for dinner! If you win, I want to hear about it!! I had to carry through on the accidental theme I started -- 2 weeks ago was 1992, then 1996, which brings me now to 2000. This picture is of my eldest, within an hour of his birth on November 14, 2000. 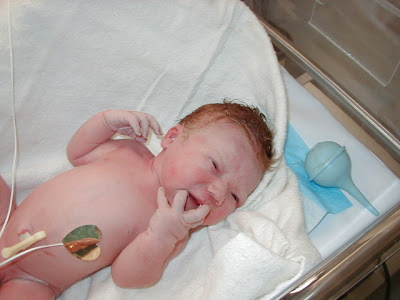 He was born 12 weeks to the day I found out I was pregnant -- and yes, he was a full-term baby, born 4 days before his "due" date. If you know me, you know the story. If you don't know me, the quick version is that I was told I'd never conceive, so I ignored all the symptoms until they couldn't be ignored anymore. The last 2 pictures were probably the highlights of those years, and Colin's birth was definitely the highlight of 2000. It's been an amazing journey being his mother! I'll tell you a secret. When I receive a children's CD, I take it with me to work and listen to it on the way to work. I do this just in case it's music I never want to hear again! If I don't like the CD, I never have to share it with my kids. So, when I received copies of Barnyard Dance: Jug Band Music for Kids and Buckwheat Zydeco's Bayou Boogie , I slipped them both in my work bag with the intention of listening to them on my commute. As it turns out, I didn't need to worry. Both CDs have toe-tapping music that's easy to listen to and not grating to my ears. Now, that it passed the "Mom Test," it needed to pass the "Kid Test." As I sat at my desk one day while the boys did homework at the kitchen table, I started playing the music. Nate spoke up and asked "Hey, what is that?" Colin tried to discern what instruments were being played and Lydia began dancing around. Ok, it's easy to get Lydia dancing, but in any event all 3 kids enjoyed the music and gave these CDs their seal of approval. You can find them at Amazon, or other major retailers. Apparently I'm on a nostalgic kick. 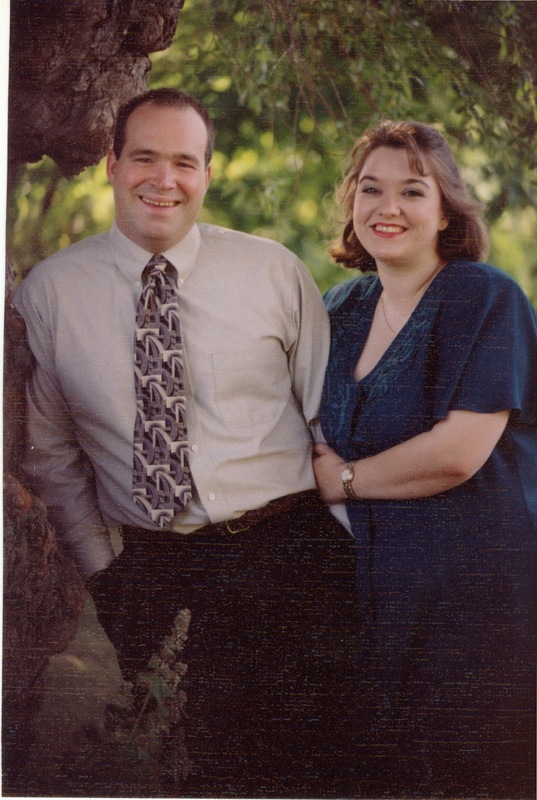 This photo was taken in the Fall of 1996, a few months after we were engaged. It was taken at a park near where we lived in Milwaukee, WI. We had the same photographer take our engagement photos and shoot our wedding and I am still very happy with the photographs we received. I'm embarrassed to tell you, though, that my wedding photos are sitting in a box in my office and I've never even put them in an album. Lydia didn't believe that this was her Daddy because he had hair on the top of his head. After more careful consideration, though, she finally believed it was him. I have been a fan of Putumayo CDs for as long as I can remember -- and I especially love the Putumayo Kids compilations. I know that I've shared our love for them before, (here and here), and they are often heard playing in our house. I was excited to open an envelope last week and find an advance copy of Putumayo Kids Acoustic Dreamland . All of my kids fall asleep to music, and while we definitely have some favorites in our house, we also like to find new music to add to the rotation. Nate especially likes to fall asleep to music, so I gave him the CD the night it arrived so that he could test it out. The next morning, he informed me that I should put it on his iPod and that it only took 3 songs before he was "out cold!" I listened to the CD and agreed that it was a wonderfully relaxing CD. It starts with a cover of Mary Chapin Carpenter's "Dreamland" and continues from there with sweet music. I'm hard-pressed to choose a favorite, but I really liked "You Can Close Your Eyes." I've yet to be disappointed by a Putumayo compilation, and this one didn't disappoint either. I'm happy to add it to our collection, and expect to listen to it for years to come! The CD releases on February 22, 2011, but is available for pre-order on Amazon . I used to post my monthly reading lists a few years ago, and I liked looking back over them recently. I thought I'd try again this year to track what I read. If there's a kid's book I especially like, I may post it, but I won't be listing all the children's books I read in a month since that list would easily count in the 100's. I read them all on my Kindle , and all except the last one I picked up for free. I know I've said it before, but I still love my Kindle, over a year since first receiving it. The fact that it is so easy to carry, I don't have to choose which book to carry with me, and that I can access all my books through my iPhone as well make it one of my favorite things. Some books are free for just a short time, so I tend to check the bestselling free books each morning to see what I can add to my Kindle for future reading. Of the books I read last month, I think I enjoyed the story about Franklin & Eleanor Roosevelt the most. It was a wonderful look at their marriage and I felt that it was a gentle, but fair, explanation of their lives as husband and wife. Yesterday, I posted about our Chinese dinner. One of the recipes that most liked was Beggar's Chicken -- which came from the International Cookbook for Kids . I think Nate appreciated the story behind the recipe more than anything, but he also enjoyed the finished product. The legend is that a beggar stole a chicken from a farmer. The beggar built a fire and began to roast the chicken, but quickly heard the farmer coming on his horse. So, he pulled the chicken off the fire, wrapped it in lotus leaves and buried it. The farmer couldn't find his chicken, so he rode away. The beggar dug up the chicken and found that the mud had created a shell around the hot chicken and cooked it perfectly. Turn the dough onto a floured surface and knead until it is smooth. Remove pork and add remaining 1T oil. Add onions, celery & bamboo shoots. Stir-fry for 2 minutes. Return pork to pan and add salt and hoisin sauce. Cook for another minute or 2, making sure all is well combined. Put stuffing in a bowl and cool completely. Refrigerate until ready to use (this is the stuffing to put on top of the chicken. Unwrap the dough and divide into 6 equal pieces. Roll out each piece to about 6 inches wide. Lay 1 chicken breast in center of dough. Top with 2 T pork stuffing. Gently fold dough over the chicken and seal edges. Place chicken in greased baking pan. Repeat for all chicken breasts. Bake for 40 - 50 minutes. I don't have a picture of the final product, but it was a pretty dish. It could be cut up with knife and fork, or even eaten out of hand.